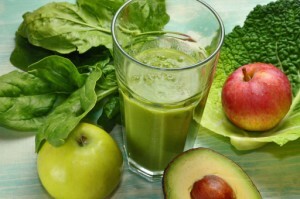 Green smoothies are great for breakfast or a snack, as they will provide you with a lasting source of energy. Fruits are a good source of energy, but eaten alone will only provide short bursts of energy (they contain lots of sugars, which are quickly metabolized). Because of their high content of veggies, green smoothies have a balanced sugar content. They are also full of vitamins and minerals. You can easily substitute any ingredients for similar ingredients available. Throw everything in the blender and blend until smooth. If ingredients get stuck, turn off blender, add a bit of extra water, mix with a spoon and blend again. Pour into individual glasses, serve and enjoy. The smoothie can be kept refrigerated for 1 day or you can freeze it into popsicles! But, as always, we recommend drinking it FRESH!